Are you ready to invest in your quality of life with dental implants in Orlando? As the most successful tooth replacement option, you will enjoy a solution that has the potential to last for a lifetime. Although you are excited to start your journey to a complete smile, we understand you have several questions about the process. Here is what you can expect when replacing your missing teeth. 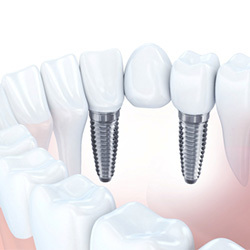 Consultation To ensure dental implants are right for you, you first need a consultation with your dentist in Orlando. In addition to discussing your medical and lifestyle history, your oral health is also evaluated. A CT scan is needed to view all your oral structures. Depending on the results of the imaging, we may recommend you have additional procedures prior to placing your posts, like bone grafting. Placement of Posts After the foundation is set for your new smile, you will undergo a surgical procedure to place the posts into your jawbone. Your gum tissue is opened to expose the bone. Small holes are drilled into it to allow the posts to be inserted. Healing Process The implant posts stimulate your jaw to encourage new bone growth. This allows your jaw to fuse to them. The process can take several months to ensure the post stay securely in place. To limit any interruption to your daily life, you can be fitted with temporary restorations. Abutments After adequate healing has occurred, abutments are placed on your posts. They act as connector pieces between the posts and your restorations. Restorations The final step to replacing your teeth involves crafting your custom-made restorations. Digital impressions are used to create them with precision and accuracy to meet your exact needs. They are made to look like natural teeth while also enhancing your oral functions. Now that your smile is complete, it is time to protect your investment. 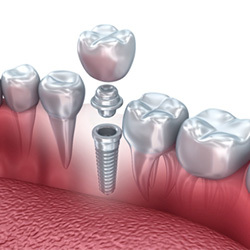 With the right aftercare, your dental implants can last for several decades. It is best to maintain your oral hygiene and clean around the abutments and posts well. In addition to home care, do not forget to visit your dentist twice a year for a cleaning and checkup. Start your journey to a complete smile today. Schedule your appointment with Sand Lake Dental to see if dental implants are the right solution for you. We look forward to giving you a healthy, confident smile.